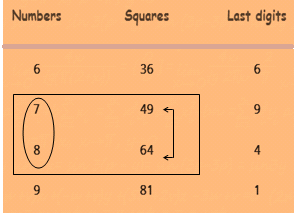 In the page "trick to find square root of large numbers" we are going to learn how to find square root of any number in a easy way. 3 is square root of 9.
and the number or expression inside the radical symbol is called the radicand. 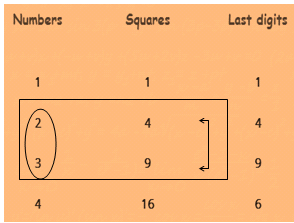 Squares of 1 and 9 are having 1 in the unit place. Squares of 2 and 8 are having 4 in the unit place. Squares of 3 and 7 are having 9 in the unit place. Squares of 4 and 6 are having 6 in the unit place. Squares of 5 has 5 in the unit place. Find the square root of 576. Let us learn trick to find square root of large numbers. To find the square root this number, first we have to split this into two groups. Th numbers which are in unit and ten's place in one group and the number which is in hundreds place in other group or put comma before two digits from the last number. Now we have to consider the first number that is 5. In the squares column 5 lies between 4 (the square of 2) and 9 (the square of 3). Since 4 is smaller than 5,we have to choose 2 (from the numbers column) which is corresponding to 4. So far, we have found the first digit of square root of 576. That is 2.To choose the second digit we have to multiply first digit 2 by its preceding number 3. 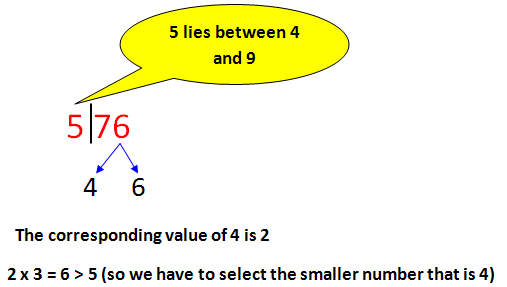 2 x 3 = 6 which is greater than the given number.So we have to choose the smaller number out of 4 and 6. Smaller number is 4.So the second digit is 4. Square root if 576 is 24. Th numbers which are in unit and ten's place in one group and the number which is in hundred and thousands place and in other group or put comma before two digits from the last number. Now we have to consider the first two number that is 62. In the squares column 62 lies between 49 (the square of 7) and 64 (the square of 8). 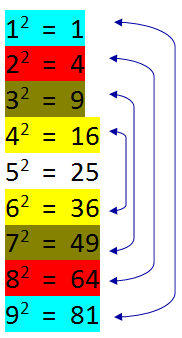 Since 49 is smaller than 62,we have to choose 7 (from the numbers column) which is corresponding to 49. So far, we have found the first digit of square root of 6241. That is 7.To choose the second digit we have to multiply first digit 7 by its preceding number 8. 7 x 8 = 56 which is smaller than the given number.So we have to choose the greater number out of 1 and 9. Greater number is 9.So the second digit is 9. Square root if 6241 is 79.